Grace and Cary Kanoy have been making themselves known in their community in Thomasville, NC. They’ve joined many local boards, they’re leading an effort to develop a food council, and Grace recently gave an address at the annual State of the City and State of the County event. This young couple is stirring the pot with some big ideas; they believe the timing is right to make Thomasville a city of the future. For the past couple of years, the Kanoys have been dreaming big and exploring Thomasville and Davidson County. They began by pondering the question: what are two things that we need as a family to stay in this area? Their answer: food and fun. By food, they mean locally grown, fresh food. And by fun, they mean outdoor recreation. Grace and Cary both believe that Davidson County could be a regional destination for food and fun, and they imagine the community as the future Day Trip Capital of North Carolina. They imagine an underground creek running through downtown Thomasville daylighted, or opened up so residents can enjoy it. Its old mill buildings could be transformed into a park site, dotted with enough dogwood trees to draw tourists to an annual spring blossom festival rivaling the cherry blossom celebrations of Japan. They imagine a network of bike trails that could host cyclo-cross competitions and dual-slalom races. They see an economy based on the tradition of small farms: the butcher, the baker, the beekeeper, the cook, the canner, the hunter, and the outdoor explorer. They imagine a Davidson County that draws in the new American pioneer – the risk takers, the economy builders. They imagine a community where physical activity is simply a part of daily life and the economy. But this was not always the case; in years past they admit to being vocal critics of Thomasville, albeit from the confines of their kitchen. The couple relocated to Thomasville in the early 2000s, moving to the farm that has been in Cary’s family since the 1870s. Although there were not many amenities in Thomasville, they loved the idea of moving back to the family farm and being in the country, as opposed to the big city life of Vancouver. In 2010, the couple attended CFSA’s Sustainable Agriculture Conference in Winston-Salem, a big turning point for their family. They came primarily because Cary’s dad was growing older; they were concerned about the future of the farm. Due to the many opportunities they believe exist for Davidson County, Grace and Cary have now made it their personal mission to get involved in all aspects of their community. For the past two years the couple has been fully engaged in a handful of groups. Cary is member of the Thomasville Chamber of Commerce Board of Directors. Grace joined the Board of Family Services of Davidson County as well as PACE (People Achieving Community Enhancement), which focuses on downtown enhancement in Thomasville. Cary lobbied to be on the advisory board for the Yadkin Valley Career Academy, a new local STEM (Science, Technology, Engineering, Math) school, and is now co-chair of its Executive Board. All it took was asking to join and actually showing up for meetings. In 2012, the couple started to hear about the different community food councils that were popping up around the state and the rest of the country. They became intrigued and wondered what a food council could do for Davidson County. In early 2014, the Kanoys heard about a webinar hosted by the Center for Environmental Farming Systems and UNC School of Government on food council development. They worked with the Davidson County Health Department to host a viewing site for the community. Around 13 people showed up to view the webinar, and the group expressed a strong interest in pursuing the establishment of a community food council. Since that time, Cary and Grace have been dropping in on various farms and local farmers’ markets to collect names to add to their growing email list of people who want to join the food council discussion. The more people they speak with, the more they learn about various parts of the food system. The more connections they make, the more they find out about individuals and organizations that are already working towards a healthy, safe and vibrant community food system. “The number one issue in our community is communication. There are wonderful organizations but all in their own insular areas. There is no intra-organizational discussion,” said Grace. Grace and Cary imagine what their community might look like with new devotion from county government towards making Davidson County a destination for recreational travel and a hub for locally grown foods. They believe that an official food council could help build collaboration and break down silos within the community. The group that met for the food council webinar has reconvened twice since and has plans to meet again in January. Meetings are held in different parts of the county so that all community members have an opportunity to engage in the discussion. Through all of their networking and conversations the couple has already learned some encouraging facts about Davidson County. 1.) We have discovered that Thomasville City Schools has a grant to supply fresh fruits and vegetables to the students and that the Nutrition Director has been able to get a grant to provide free breakfast and lunch to all students in the school district. We don’t understand the regulations and that is one of the obstacles to actually connecting local producers with the schools. The Health Department has assisted several convenience stores and gas stations to sell fresh produce by providing them with an extra cooler to hold product. 2.) The Health Department has assisted several convenience stores and gas stations to sell fresh produce by providing them with an extra cooler to hold product. 3.) There have been attempts in the past to supply local produce to restaurants, but it was a one-man deal. We think we can resurrect this effort. 4.) We have re-recruited some of the past pioneers to come back and join the challenge, partially because the timing is right and people are ready to assist. June Holley, author of The Network Weaver Handbook, describes Network Weavers as people who “identify a network of people with common interest and help them to focus on increased effectiveness of that interest.” She goes on to explain that networks are everywhere, but someone has to help people become aware that they are actually part of a web of relationships for them to make a real difference. Grace and Cary Kanoy embody this definition of Network Weavers; they are working to strengthen their community food system by networking and connecting people across their county towards a common goal. And all they had to do was ask and engage with their community! Well – ask and engage, go to many meetings, keep up with their blog, their garden, and their kids. They acknowledge that it has taken a lot of work, but they are excited about the prospects for the future of Davidson County. Plus they have met a lot of new people in the community. If you ever have the pleasure to visit the Kanoy homestead, you will likely leave with an armful of homemade jam, some veggies, a link of venison sausage, and maybe a rabbit or two if you’re lucky; it’s no wonder they’re making friends across the county! For more information on these efforts, on June Holley and Network Weaving, or on food councils in general, please email CFSA’s Community Mobilizer, Jared Cates, at jared@carolinafarmstewards.org. 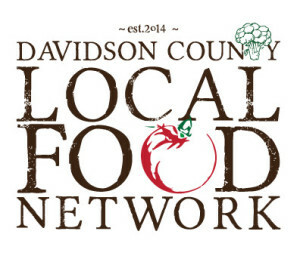 Keep up with the latest from the Davidson County Local Food Network on their blog or facebook.